Illustrations from " Kamehameha in Kona: Two Documentary Studies" by Dorothy B. Barrere, Bernice Pauahi Bishop Museum, Honolulu, Hawaii. 1816: Ahu'ena Heiau sketched by Louis Choris, the artist on board the Russianship Rurick, captained by Lieutenant Otto von Kotzebue. After Kamehameha's death in 1819, the French ship Uranie landed at Kamakahonu. Captain Louis de Freycinet's journal makes it apparent that Ahu'ena had fallen into disuse: "...almost all of the images there had been thrown over and the sacred house of the sovereign was open and filled with furniture of European or Chinese origin, which had been used by the deceased king." 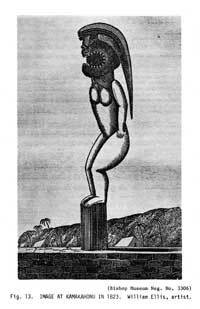 The drawing of Ahu'ena made by Jacques Arago, ship's artist, shows two anu'u towers, verifying the account of Kamakau that a second anu'u was built for the weaving of the ka'ai that held the bones of Kamehameha. Arago described the "morai" (heiau) as 'very much neglected." According to John Papa I'i in addition to Ahu'ena Heiau and other structures associated with his court at Kamakahonu, Kamehameha "...built another house, a hale nana mahina'ai, on the seaward side of Keawe a Mahi's residence from which to observe the farm lands. Facing directly upland toward Kuahewa, this house was like an observation post, for the site ha first been built up high with stones. It was located on the west side of Ahu'ena, a heiau that stood beside Kamakahonu, on a spot where canoes could be seen coming from South Kona and from the vicinity of Kailua in North Kona." .